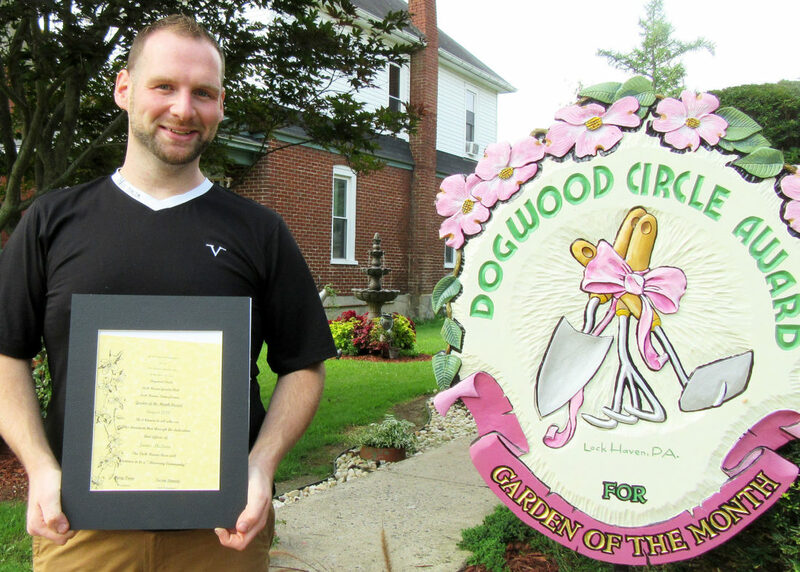 James McLean, 439 S. Fairview St., Lock Haven, has won the August Garden of the Month Award from Dogwood Circle Garden Club. Annuals such as sweet potato vine, alyssum and many varieties of portulaca, begonia, impatiens, coleus, combine with perennials including coneflower, ferns, ornamental grass, hosta, and various varieties of vines for color throughout his gardens. James creates and employs garden accessories of wood, pottery and antique items to add interest and whimsy. Large planters spill a variety of colorful flowers along the walk at the side of the house, and the front steps and porch are lined with lush potfuls of flowers and grasses. A grapevine twines across the front of the porch, and vines, grasses and planters soften the hard edges of the porch columns. All are lit at night in a stunning display. More photos may be seen on the club’s website: www.lhgardenclub.com. Nominations for the September award may be made by calling Marion at 570-748-3672 or Connie at 570-753-5425 by Aug. 30.